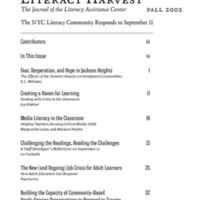 [pdf document, Literacy Harvest, Literacy Assistance Center, New York, Fall 2002] A special issue of the Literacy Assistance Center in New York, with articles reflecting on how both students and teachers responded to the September 11 crisis. Articles cover the attacks effects on immigrant communities, how to deal with crisis in a classroom setting, and helping students develop critical media skills. The Literacy Assistance Center, www.lacnyc.org, is a not-for-profit organization that provides essential referral, training, information and technical assistance services to hundreds of adult and youth literacy programs in New York. “The NYC Literacy Community Responds to September 11,” September 11 Digital Archive, accessed April 21, 2019, http://911digitalarchive.org/items/show/2893.